I cooked to order tonight. Ok, so I'm boasting a little, but there was a certain little giraffe who insisted on fresh salsa tonight, and a certain other half who fancied pan-fried fish. So who was I to argue? There's something that always disappoints me about people who won't eat crispy skin. Seriously my lovelies, it's the best part - on fish, on chicken, on potato... that lovely crunch against the soft flesh of the meat / fish / vegetable - just like battered fish or deep fried chips. Ok, so you might be a quasi-vegetarian like my Mum, but even that's not an excuse. So, here's tonight's dinner - fresh, quick and perfect for a summer night. If you can, get those baby mini potatoes (£1 a packet from Sainsbury's - bargain), and boil them until just about cooked. Always cook root vegetables in water that's cold first - they are harder than vegetables grown above ground, and cooking in water that's cold at first means they cook all the way through as the water heats up. Drain the potatoes and place in a baking dish with a big generous glug of olive oil, a little fresh rosemary, a sprinkle of paprika and loads of salt and pepper. With a potato masher, gently crush the tops of the potatoes so that they split but don't mash, and stir around a bit in the dish. Stick in the oven on high for 20 minutes, until they are browning on the top. Finely chop half an echalion shallot, half a red chili, a clove of garlic and a handful of parsley. Mix with four chopped fresh tomatoes, a very generous glug of extra virgin olive oil, a sprinkle of cayenne pepper, some salt, black pepper and a teaspoon of sugar, and leave for half an hour at room temperature to mulch together. You'll have enough for four sides, so if you're only feeding two plus a small giraffe like I was, use the rest tomorrow as it is or for the base of a tomato sauce. All the ingredients are raw so this really does give a real punch - if you like your salsa more like out-of-a-jar-doritos-style I recommend cooking it down for 15 minutes and then sticking in the fridge. (Still nicer than out-of-a-jar-doritos-style though). It's really important to make sure the fish is at room temperature before you cook it - if it's just out of the fridge it will just curl straight up in the pan and will cook too quickly on the outside. Heat a frying pan on a medium heat and throw in a big knob of butter and a little oil (which stops the butter burning). When the butter has melted quickly season two sea trout fillets and pop flesh side down into the pan. Cook for one minute before seasoning the skin side and flipping over. Press down with a fish slice for 15 seconds so that the skin gets the heat of the pan, and cook for three minutes, basting the top (flesh) side with the butter as you go. Crispy fish skin was definitely one of the most common mentions on Masterchef this year. 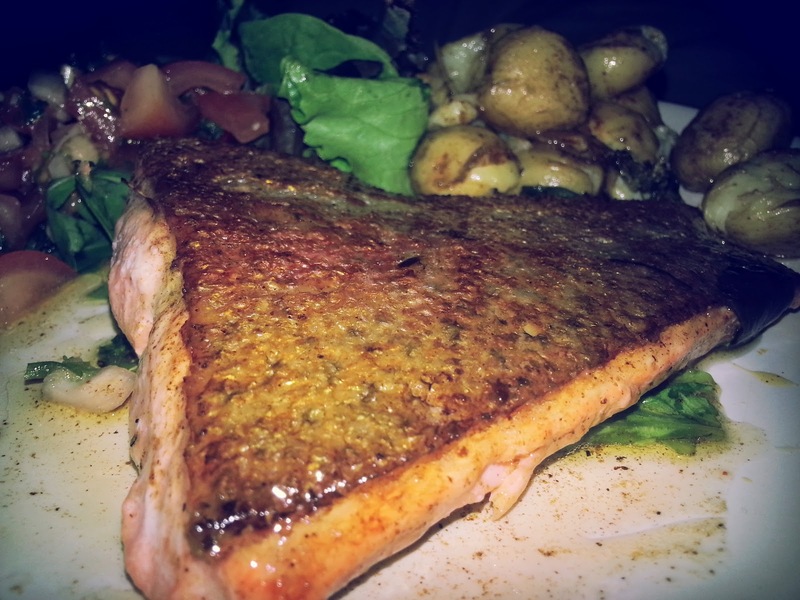 Just how I like fish , too ... sea trout has such a lovely delicate flavour and this recipe is perfect .